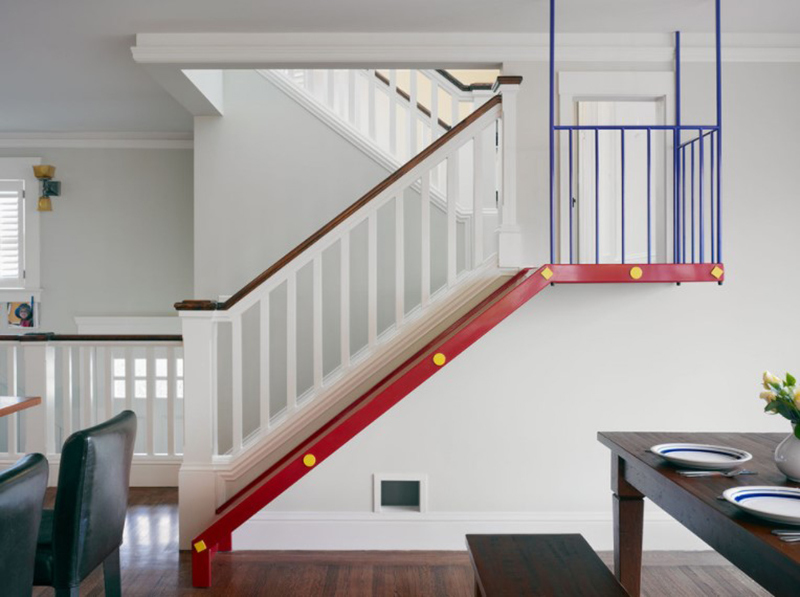 Bring out your inner child with this fun feature inside your home! Who says you cannot be playful inside your house? Of course, you can have fun with family and friends in different ways. But how about adding a certain feature that will bring more fun to your home? A gaming room would be nice where you can add a billiard table or a pool table. You can also allocate an area for computers. But aside from that, there is an even more creative way to enjoy your home. Why not add a slide? Most of the time, we can see slides in parks or in children’s play areas. Although they are meant for children, we can actually have one inside the house! Can you picture how exciting it would be? Yes, aside from being fun, it can also be used as another way to access the lower part of the house. In some homes, they add it right next to the stairs while others place it on other areas. Sounds fun, right? Isn’t this beautiful? 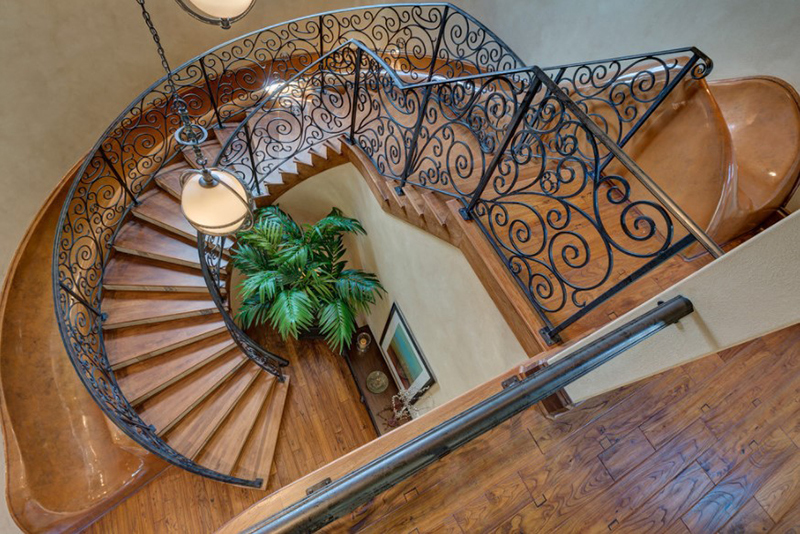 What you can see here is a curved wood staircase that has a slide built-in right next to it. This way, you are given an option for taking the stairs or the slide when you descend to the lower floor. 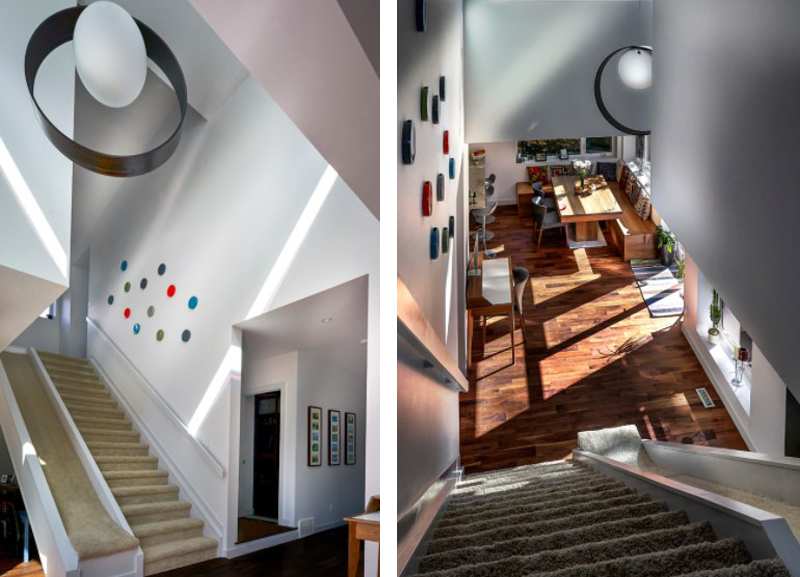 If you think that your home can only have a boring staircase, you are definitely wrong! You can actually add a wooden slide beside it not just for the kids but also for you! 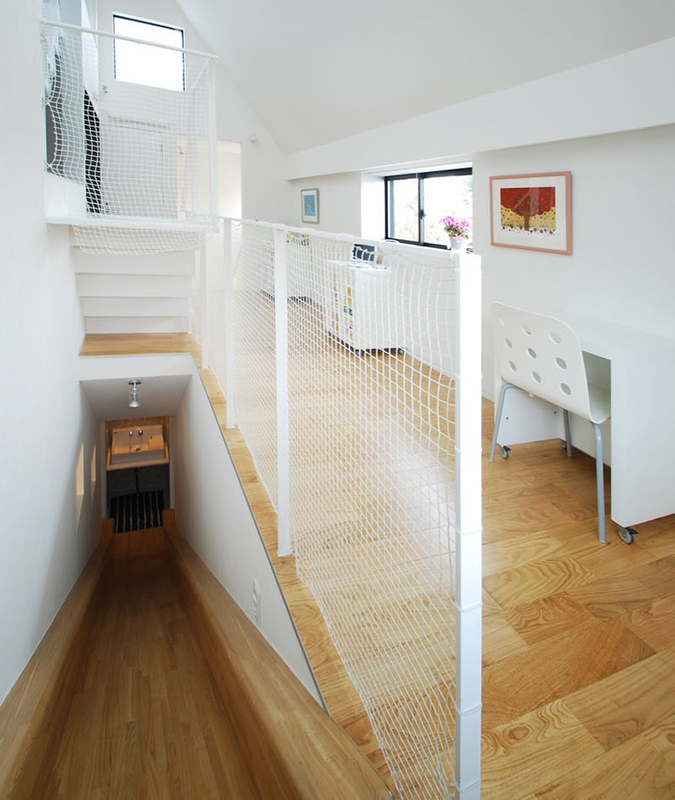 This staircase also features a study nook that is nestled under the second staircase. Love the combination of timber for the slide and some black riser for the stairs. 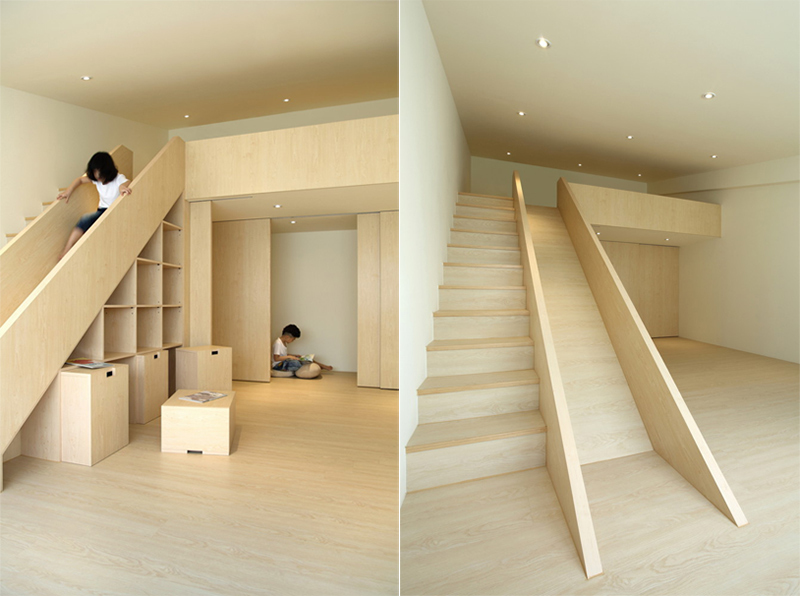 This space serves as a playground for the kids where it features shelves and storage compartments that are built into the slide and stairs. 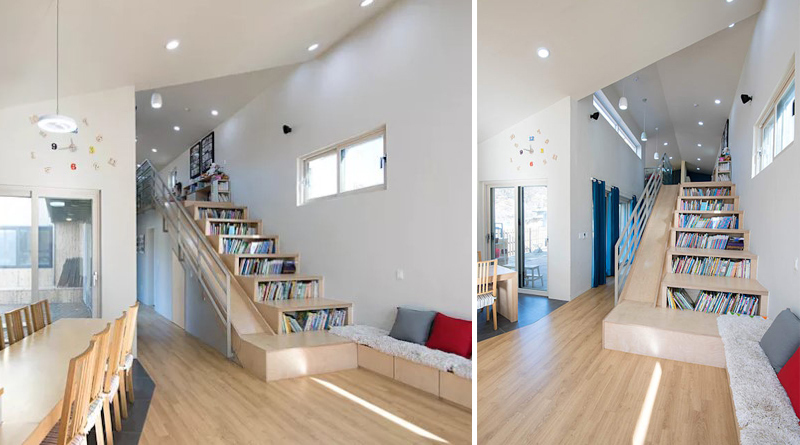 A happy family lives in this home in Sachangdong, South Korea which has two big sections. The lower floor is intended for kids while the upper one is for the parents. 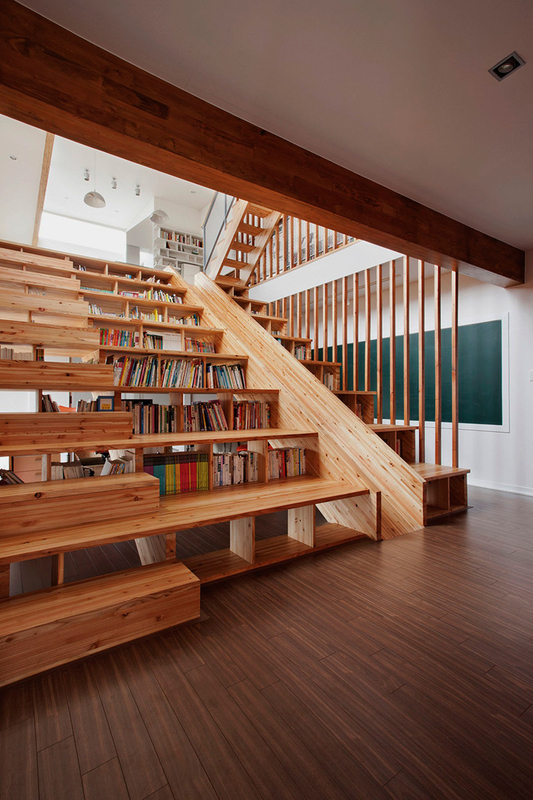 There is a large custom staircase with built-in bookshelves and a slide that connects the floors. 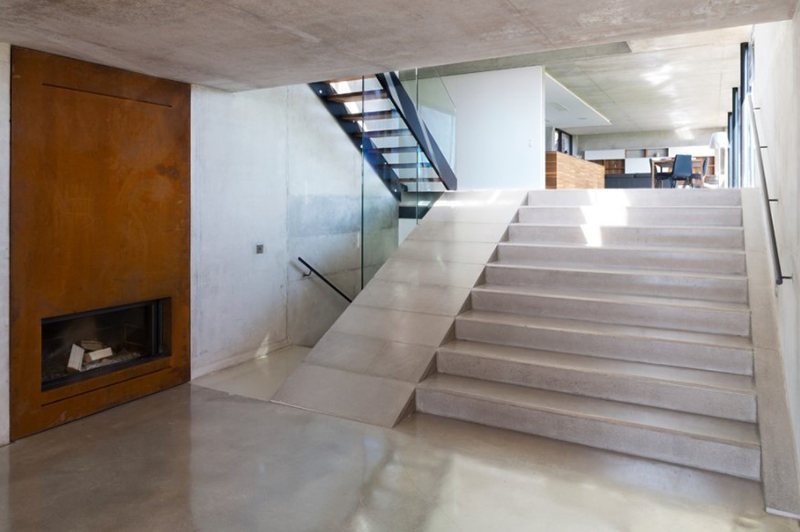 Seen here is a concrete ramp located next to this staircase which provides a sliding exit. This could also be used to push strollers and carts up and down. Totally useful, right? This is one is actually a daycare center in Belgium. 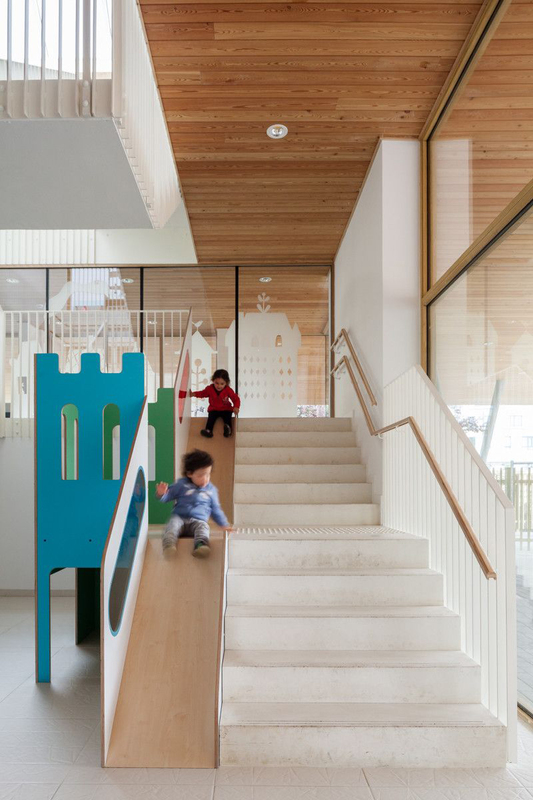 Aside from a staircase, they added a slide in the playroom. It is obviously fun for these little ones! The long slide connects three levels of the home. It is large enough for the kids to circle around, run up and slide down! The owners really wanted to have a slide inside their house. In answer to that, the designers built the slide out of walnut wood, which is the same material as the staircase. It connects the main floor of the house to the basement. 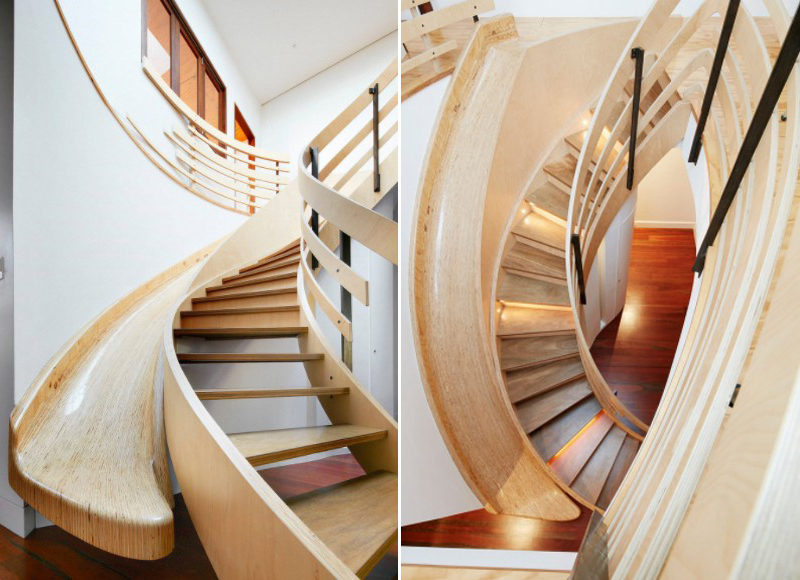 Alongside the curved staircase is a wooden slide which is a fulfillment of anyone’s childhood dreams! This one comes with beautiful steel railings. 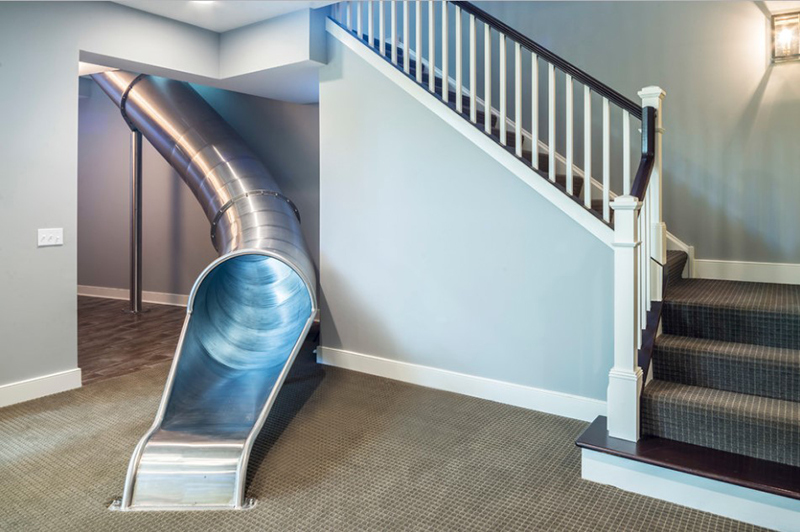 At first look, the house may look simple but once you look around, you will see this slide which is a fun addition to the home. The designers of this slide and stairs combination had to deal with the challenge of getting it approved by the city. 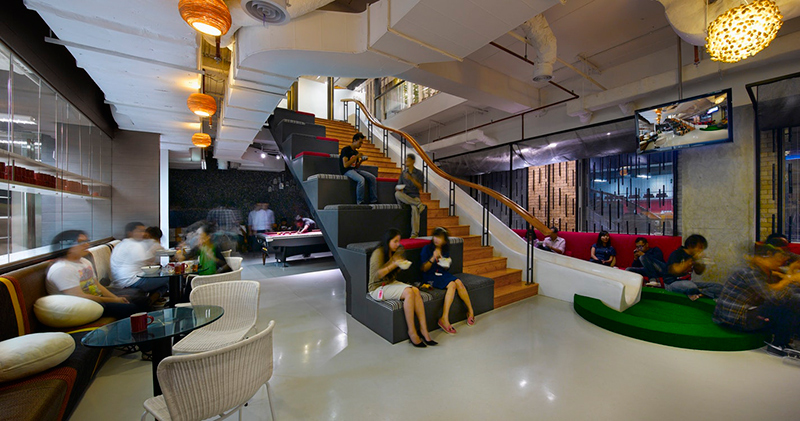 They were asked to use a carpeted surface just like the stairs. And it still worked well! 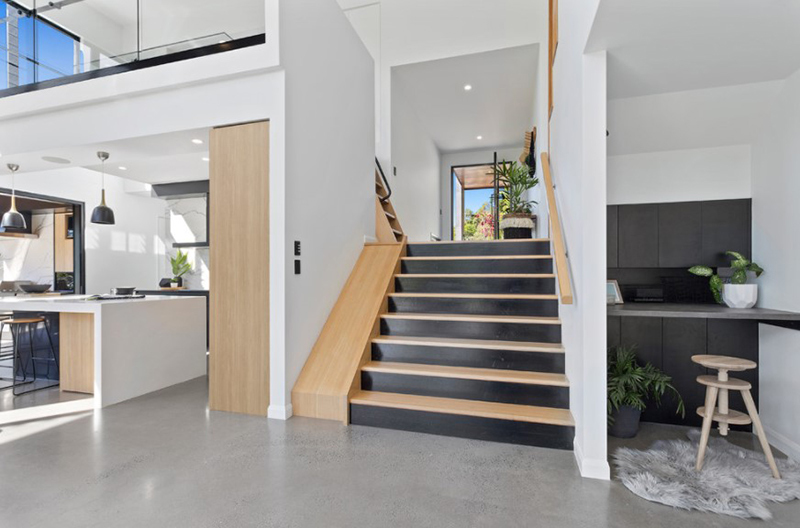 If you have an existing staircase, you can consider this as an inspiration since it shows us that we can actually add a slide next to it without destroying the stairs! 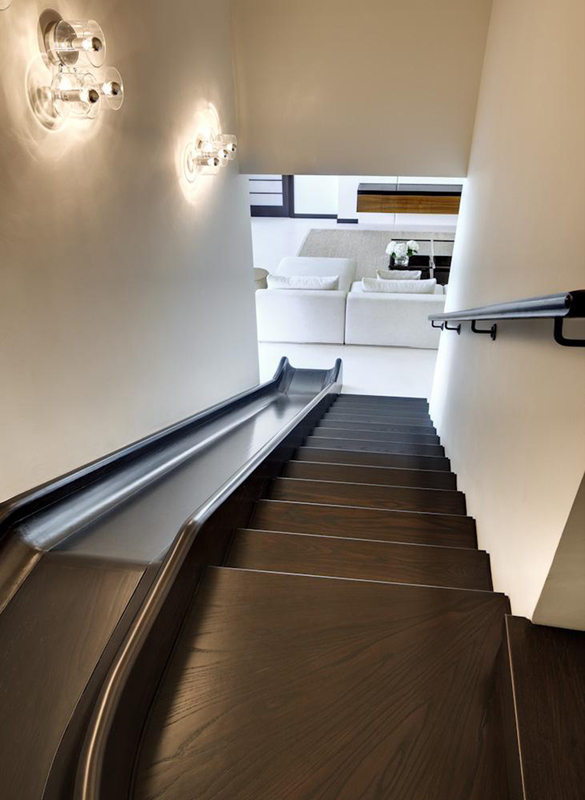 Aside from the wooden staircase, one can also use the metal slide to go down from the second floor of this apartment in Ukraine. It takes one down from the top floor right into the living room while passing through the kitchen on the way. 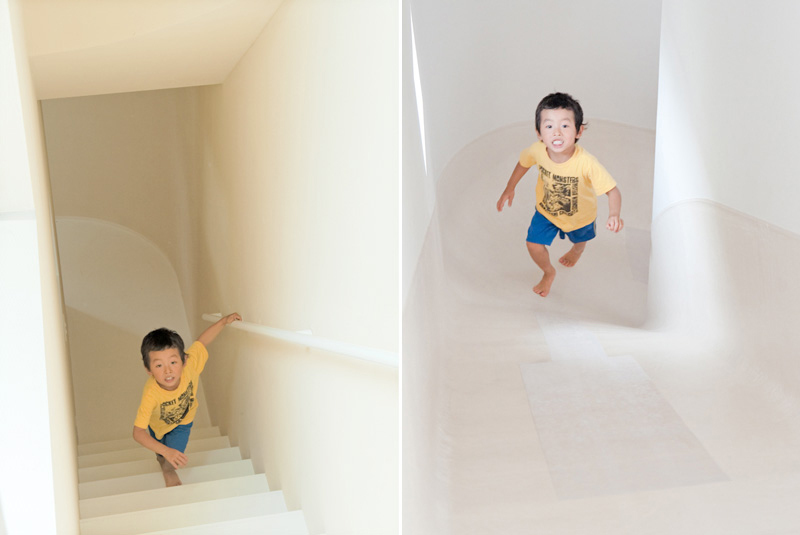 A sleek and elegant slide in a modern home adds playfulness and style into its interior. 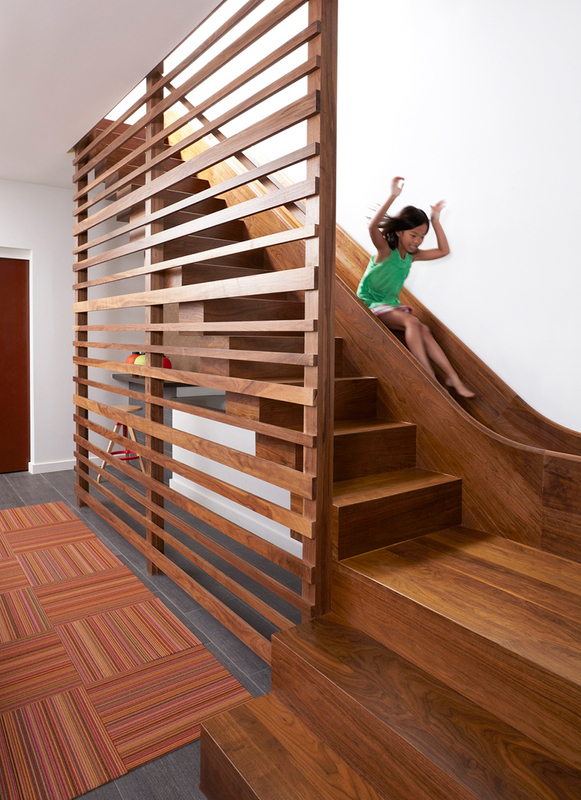 Both the slide and the stairs are made of dark-stained oak wood which is a good contrast with the white walls. This one is actually an office. Take a look at its staircase. Aside from the part which is intended for seating, the other side features a white slide. For sure, it would be fun to slide down after a tiring day at work! 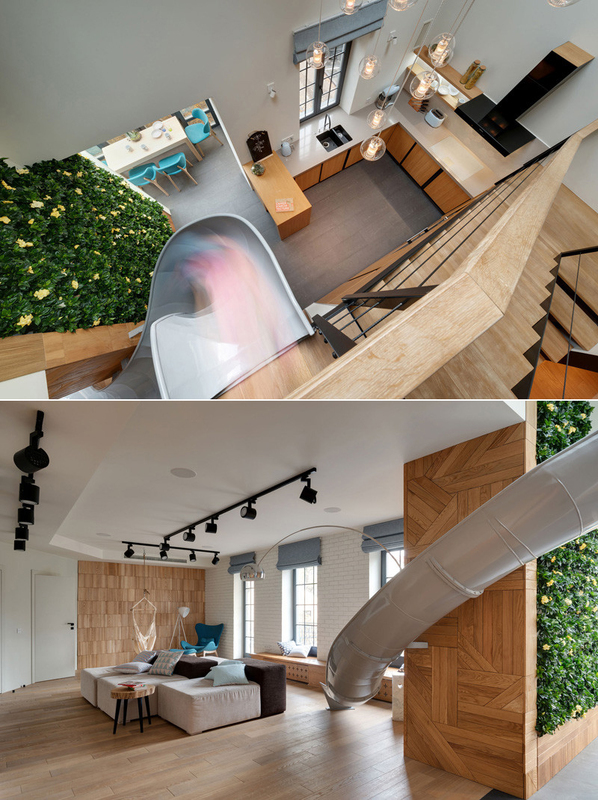 Two penthouse suites are connected with a metal slide. This way, the two separate spaces are being combined into a single suite. This white and wooden interior features a wooden slide that is surrounded by white walls. It is connected to a work area and a bathroom. This may look like similar to your home’s staircase but what makes it extraordinary is the slide beside it. 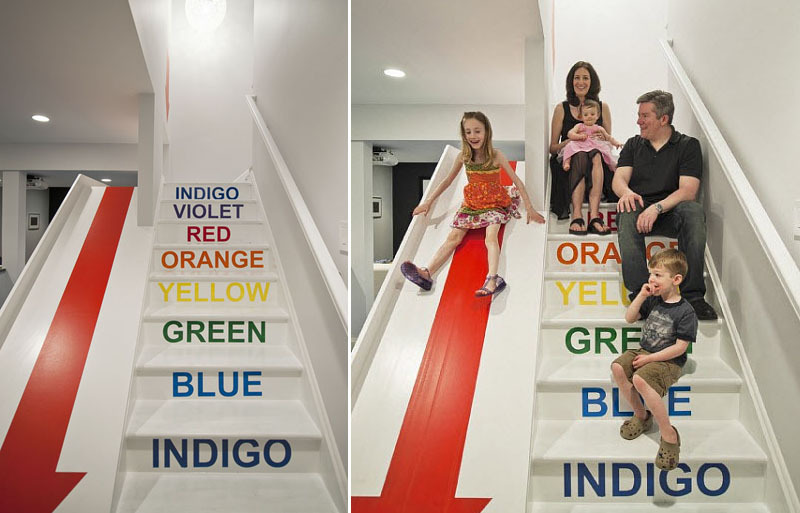 Also, the color names on the stairs and the red down arrow on the slide gives it another childish touch. 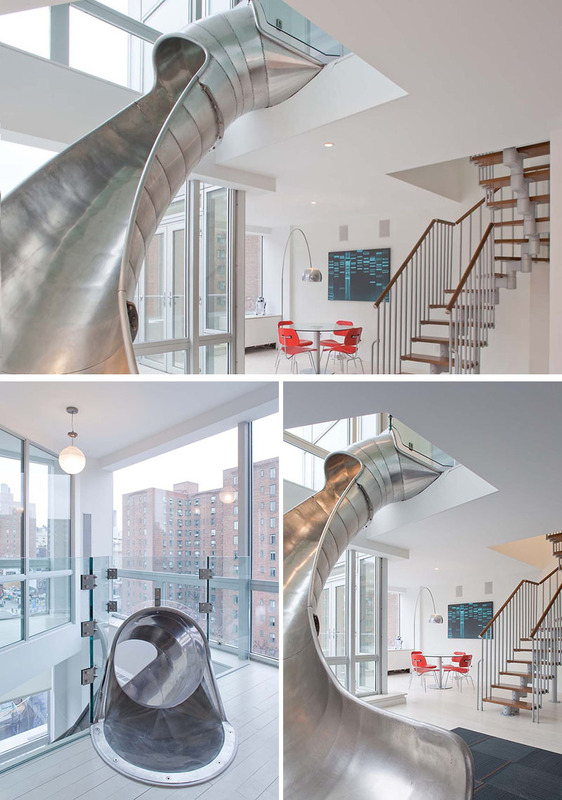 For sure these images made you feel excited about adding a slide into your home. They can be made out of plastic, wood or metal. 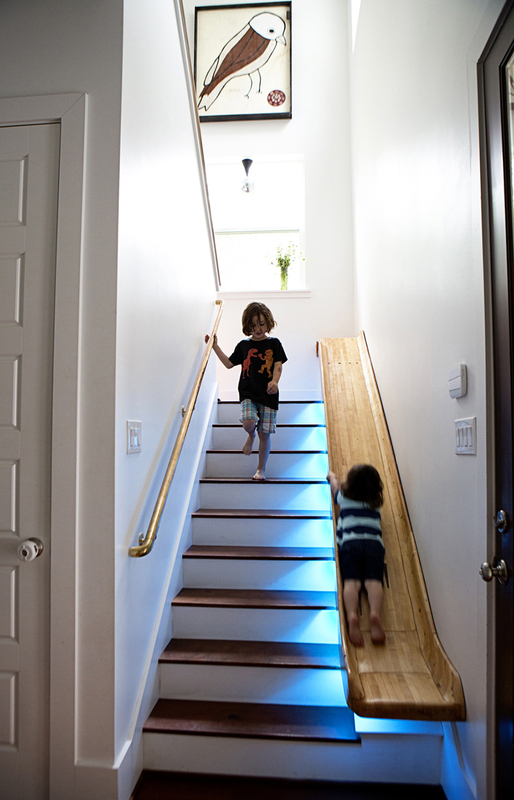 Whatever they are made of, they will surely give you and your kids a fun way to go down from your home’s upper level! This will also bring out the inner child within us. Your guests will also be excited to visit your house because of your slides! This list will no doubt inspire you to add a slide in your home. But before you do that, see to it that it is okay to add one in your space. Don’t forget to consult the experts! Of course, you can add slides outdoor too! One of the most common places to add a slide is in your pool area.